Want to win a getaway for two? Visit seaisland.veranda.com and enter the Veranda Sea Island Getaway Sweepstakes now for your chance to win a two-night stay at The Lodge at Sea Island, Georgia plus, airfare for two and more. A grand prize worth over $3,500. The Veranda Sea Island Getaway Sweepstakes is open to legal residents of the 48 contiguous United States and the District of Columbia, who have reached the age of 21 in their state or territory of residence at time of entry. The Sweepstakes begins on February 19, 2019, at 12:01 AM (ET) and ends on April 29, 2019, at 11:59 PM (ET). Limit one (1) entry per person for Sweepstakes. The grand prize consists of a three-day, two-night stay for two (2) at The Lodge at Sea Island, Georgia (standard accommodations, single room, double occupancy) plus one (1) $600 resort credit per stay ($300 resort credit per day of stay), ARV: $2,080; domestic, economy class airfares for two (2) from major airport nearest Winner’s residence, ARV: up to $1,000; and transportation to and from JAX, BQK or SAV airports with Sea Island transportation, ARV: $500. 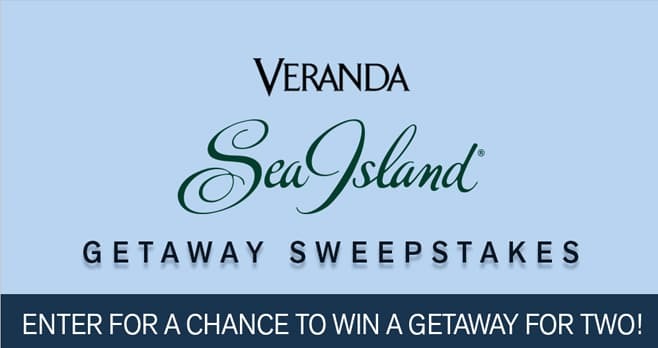 Visit seaisland.veranda.com to enter and see Official Rules for details.